Created by Masa Harima and Lisa Bosques of the Seattle, Three Tree Tea is the successor to their widely beloved neighborhood tea shop in Ballard. At Masalisa, they created a signature "matcha latte," a green tea latte using a stone-milled steamed tea leaves usually associated with the Japanese tea ceremony. Now they've made it even easier to use their blend with a quick-dissolving sugar, and the product is excellent for tea and coffee shops. Unlike many competitive products, there are absolutely no additives in their Matcha Latte mix. It's a simple blend of quality matcha and sugar. A typical "tall" 12-oz beverage serving will cost about 37.5 cents per cup plus your milk and cup costs, and typically sells for about $3.50-3.75. For a 12-oz hot beverage, steam about 6-8 fl oz. milk, add 2 tsp. 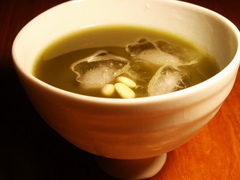 of Three Tree Tea "Ippuku" Matcha Latte Mix to a cup, and stir in a small amount of milk to dissolve. Add the rest of the milk and dust with a bit of "matcha for dusting", included in your wholesale order. You can even garnish with whipped cream for a more dramatic presentation. Most other products in this category taste best cold. 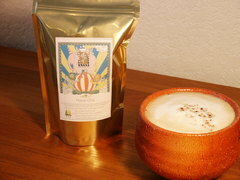 Three Tree Tea's blend is high enough quality for both hot and cold drinks, and you can even use it for frappe drinks. For venues with a liquor license, you can even create an infused alcoholic beverage. For the beverage depicted on the right, a "green tea martini" or "matcha martini", we simply blended 6-8 tablespoons of matcha latte mix with 750ml of clear dry gin, shook up the mix, and infused in an airtight container for about 5 days. After that, we store the "matcha gin" in the freezer. Blend with a whisper of vermouth and garnish with pine nuts for a green tea martini. Some customers like the matcha gin blended with milk, or use cream for a "green Russian." When was the last time you used a percolator? Masa created an excellent spiced chai tea blend that is easily prepared in a percolator and has a better taste and lower cost per cup than anything you'll find pre-made in a Tetra-Pak box. Call us for more information. You can also make House Chai to order with about 5 minutes total time in a cezve (Turkish coffee pot) or saucepan. 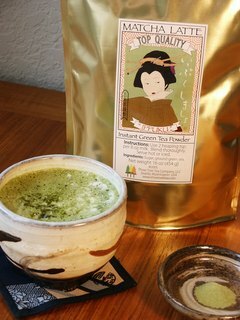 Look for more products from Three Tree Tea coming soon, including Rooibus tea blends, pure organic matcha for high-end tea service, and other quality tea products. 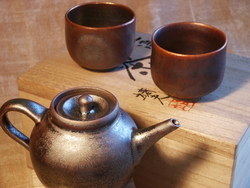 Yuzu Trading Co. will handle your wholesale orders for Three Tree Tea products. For wholesale accounts, we offer case quantities of 6 or 12 1-lb re-closable packs, in-person delivery in the Seattle area, and your choice of shipping vendor for the rest of the U.S. 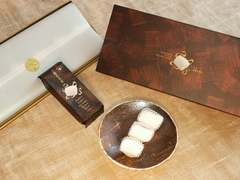 Minimum order/reorder quantity is one case. Delivery costs are as billed by the shipping vendor, or $6-12 for the Seattle area. Usual terms are COD for new accounts; Net 15-30 terms may be extended by Three Tree Tea after your account is established. Please call Jason at 206-274-4575 for specific pricing information, or contact us via email. All Uwajimaya locations: Seattle, WA, Bellevue, WA, Beaverton, OR. Central Market Shoreline,WA and Mill Creek, WA. Copyright © 2004-2005 Yuzu Trading Co. LLC. All Rights Reserved.